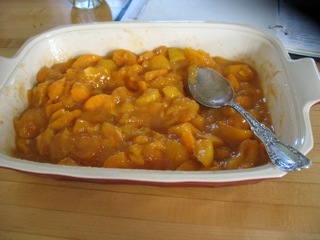 I remember eating Sarah’s wonderful canned apricots and plums when we briefly lived with you after moving to Portland. (You, Katherine, were very small.) 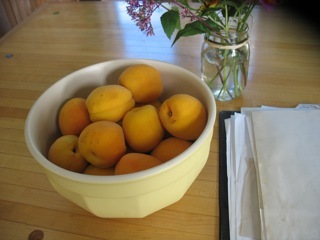 I remember thrifty Sarah pointing out that small apricots are not only cheaper, but you can fit more fruit into each canning jar. Very nice! Brings back memories for me too! 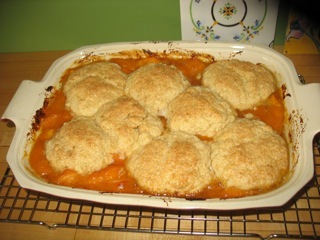 And I want to try that cobbler so badly that I might just go out and look for a few last apricots. Benny is in need of more calories and I’ve been slacking on the food front. You’re not alone! I just had the same experience with peaches. 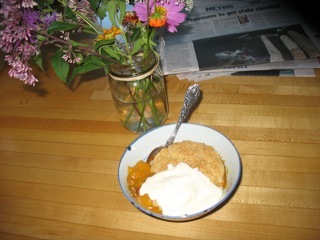 I got a load of peaches from my CSA and they were out-of-this-world, but when I needed to supplement with a few extra for peach cobbler, I was woefully disappointed by the ones I encountered at my local market. They were totally lacking in flavor! So then I rode up the street to the fancy-pants gourmet market, and the peaches there were different in only one way: they were more expensive (but equally as boring — with my eyes closed, the one I tried could have been an underripe apple). Two bad batches of peaches later, I gave up and supplemented with blakcberries. 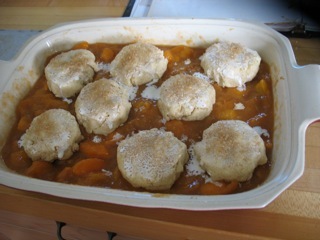 Sticking with CSA and farmer’s market fruit from here on out.